The Environment Health Overview (EHO) is integrated into the dashboard of the Start Page. It provides an at-a-glance health status of your environment with a 100-point scale score. This scale score is based on the severity, number of occurrences, and age of the advisory events, as well as the number of servers you're monitoring. Note: Any Advisory Condition that has a defined Severity, and a Send to Alerting Channels action can affect the EHO score. The scale score returns to 100-points when no Advisory Condition events are available. For information about configuring Advisory Conditions, see the Advisory Conditions topic. 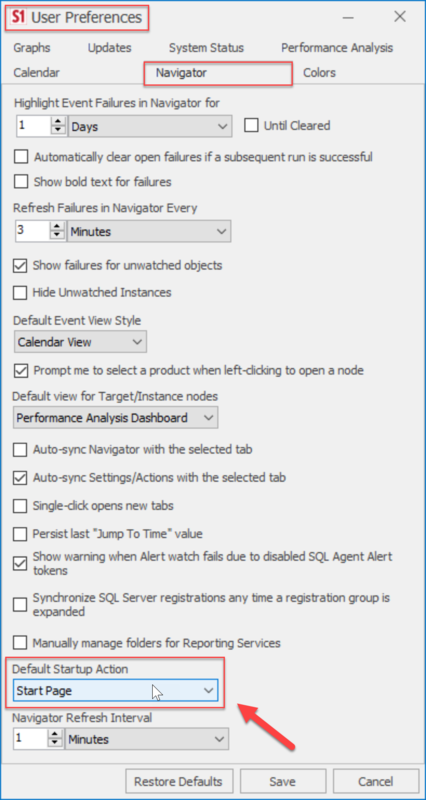 The Environment Health Overview appears automatically during the setup wizard, but if you're running an older version of SentryOne, select Tools > Run On-boarding Wizard (requires client restart). The client restarts and presents you with the necessary options to configure the Advisory Conditions to work with your performance dashboard, Event Calendar, and the Environment Health Overview. In the SentryOne client, you can change where you start in the client by going to Tools > User Preferences. Select Start Page from the drop-down list, and the Environment Health Overview appears every time you start the client. For more information about User Preferences, see the User Preferences topic. When analyzing a high volume of Advisory Conditions, two types of wedgets display on the Environment Health Overview; the first wedget is broken out by severity and the second wedget is broken out by tags. Selecting either wedget filters the list of events by severity or tags. Once you've corrected the performance issue, close the affected event by selecting the link on the events list in the Environment Health Overview. Add notes to the event, assign the note to someone else, if necessary, or close out the event. If you have many events that need to be closed out, right-click under Duration, select Close, and then select All for Condition. This closes all of the current conditions in the Environment Health Overview. As you work through the affected events in the list, you can trim down the time range using the slicer. Select the Slicers drop-down list, and then change the desired time limit. 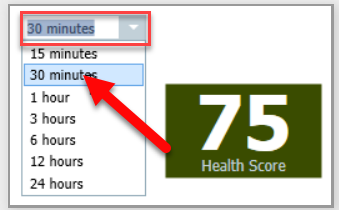 On the Environment Health Overview, select the desired event link under the Condition column. 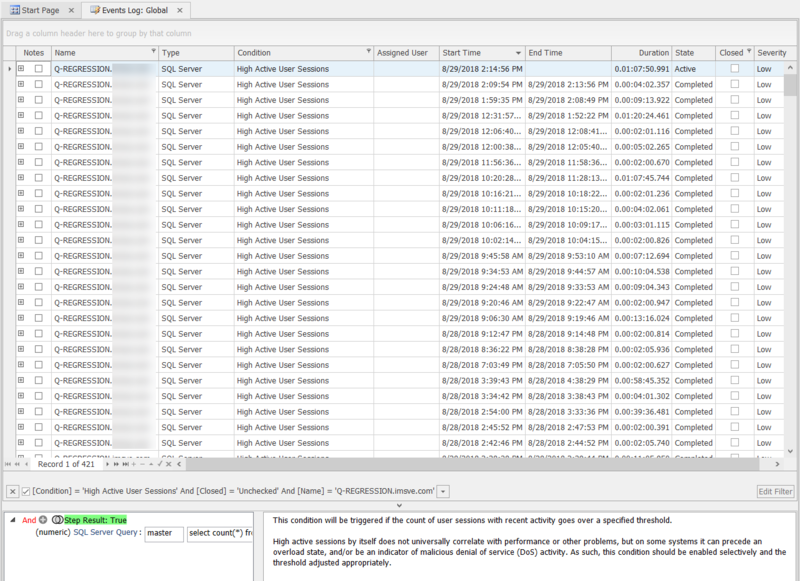 The Events Log appears filtered by the desired condition, and the filter excludes events that are closed.